Floor Standing vs Bookshelf Speakers- Which one is the best? 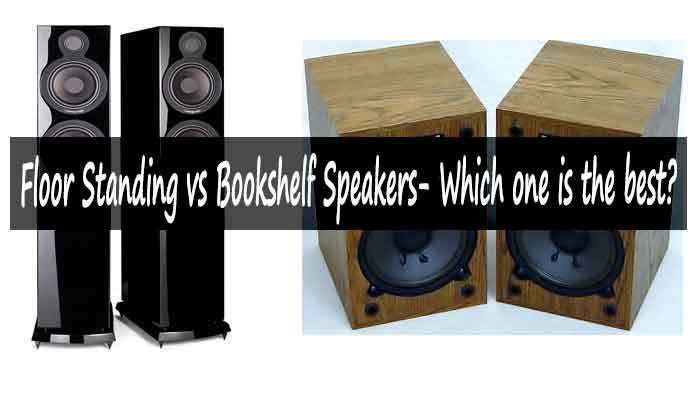 →Floor Standing vs Bookshelf Speakers- Which one is the best? It is a well-known fact that built-in speakers, be it on TVs, Laptops and other devices do not generally offer the best sound quality. A great way of upgrading them is by purchasing floor standing or bookshelf speakers. Since these two types of speakers are different, people are always confused as to which one to get. As a way of introduction, let’s look at the description of each type. As the name suggests, these are speakers that are equipped with a stand at their base. They therefore stand on the floor without requiring any extra support. They are usually rectangular in shape, and can be quite tall. This characteristic actually explains why they are also called tower speakers. They are definitely bigger than the bookshelf speakers. The bigger size allows them to be installed with specialized components that improve the bass and sound quality. They are usually sold as a pair. Unlike what the name suggests, these speakers are not especially made to be mounted on bookshelves. The name is merely an indication that they can be mounted on any raised surface throughout the home. You can place them on a desk, on a shelf and even on a wall. Most are also rectangular, although way smaller than the tower speakers. Despite this small size, they usually have a better sound quality than in-built speakers. Most also come in a pair, although you can find some with three-way designs. From these descriptions, you can already tell that each has its strengths and weaknesses. The question of which is best will therefore depend entirely on you and your needs. To help you make the decision, here are the pros of each type. Better Bass Output- as already mentioned, floor standing speakers will give you better bass. This is because they are equipped with the necessary drivers. If you like hosting parties where people dance to loud music, these are the speakers for you. Even at high volume, they will still offer great sound quality and that bass that people love. More Connectivity Options- floor-standing speakers offer you a variety of ways of connecting your devices. Apart from the usual connectivity with cables, you can also use Bluetooth, USB stick and SD card. This obviously provides more convenience especially to the younger generation. Better Aesthetics- floor-standing speakers are made to impress. The designers know that they will be displayed by the owners and therefore the many cool designs. The exterior cabinet can be made of plastic or wood, which is stylishly designed. You can also get different color combinations. Placed next to your TV, these speakers will give your home that modern and sophisticated look. Stereo Setup- these are the speakers you get when you want a stereo sound experience. They can be mounted on any corner of the house to give it that theater feel. Although most are sold as a pair, you can get extra speakers and place them wherever you want. Less Bulky- We have already mentioned that these speakers are more compact. You can therefore place them in your favorite places without attracting a lot of attention. You can even bring it close to your bed for a more intimate sound experience. No Issue with Cabinet Vibration- due to their compact design, you will never hear the cabinet vibrating. Cabinet vibration is one of the most annoying aspects of speakers, as it normally distorts the sound. Let’s also look at the cons of each model. Due to their opposing nature, the advantages of the Bluetooth speakers can also be the disadvantages of the floor-standing speakers and vice versa. Just to be clear, here are the disadvantages of each type. Cabinet Vibration- this can result from poor workmanship or develop over time. It is usually more prevalent at higher volumes, which is quite frustrating for people who like their music loud. Sometimes the issue can be solved by tightening the screws, but other times it cannot be fixed. Bulky- although they are slim, floor standing speakers normally take up a lot of space. They therefore can’t be used in places that require discreteness such as a work station. Noise Complaints- this will obviously depend on how you use your speakers. They can however get pretty loud, which might become a disturbance for the neighbors. Do not be surprised if police show up on your door for a noise complaint, especially when having a party. Limited Volume- these speakers cannot attain as high a volume as their floor-standing counterparts. While this can also be a pro, it is mostly a con for when you want to unwind and play the music loud. This also means that these speakers are not the best for a party. With the pros and cons of each speaker in mind, here’s a good guide of how you can choose the best speaker for you. If you host many parties or like your music loud with a lot of bass, go for the floor-standing speakers. The same point applies if you want the speakers to be heard in every corner of a big apartment or home. For a more intimate experience that does not disturb the neighbors, you are better off with the bookshelf speakers. If you lack sufficient space to place you speakers, go for the bookshelf type. If your home or apartment is smaller and more compact, the bookshelf speakers are still a better choice. Floor-standing speakers are usually more expensive than the bookshelf speakers. This is because they require more materials to make and also have more sound capabilities. If you are working with a tight budget, the bookshelf speakers are the best option. However, avoid going for the cheapest options of each type, as sometimes they can be of poor quality. This point cuts across the board. If you buy a poor product, it will not matter the type, you will end up being frustrated. No matter the type of speaker you choose, choose one from a reputable manufacturer. Look up the individual reviews of the different speakers to find the one that has the most satisfied customers.